Frequent collaborators Carl Bland and Ben Crowder join forces once again, co-directing Bland’s latest play Spirit House. Not unlike their previous work Te Pō, a mystery drives the narrative. But, where in that play the stakes and plot hinged on the metatheatrical, Spirit House centers on the metaphysical. Two men, situated in the same art studio in Thailand, are connected by their shared space and, perhaps, the same woman, yet separated by the sands of time. Typical of Bland and Crowder, the play toys with an absurdist sense of humour, often using levity to undercut the potentially dark or violent subject matter. This tonal juggling is a tad distracting at first, as the audience tries to figure out how the play is meant to make us feel, but eventually settles into a groove that becomes progressively more endearing. Because the characters often avoid talking about themselves, preferring to speak in ideas instead, they also become difficult to engage with as more than merely mouthpieces, the dominating subject being that of art. This is less a problem for Ian Mune’s Charles Dixon, who might be the archetypal grumpy old artist, close-guarded and stand-offish, but is performed and inhabited with complete ease. Tim Carlsen’s Steven is an eccentric neurotic that provides an energetic comedic counterpoint to Mune’s curmudgeon. More business and commercially-oriented, his ideas on art often reek of a capitalistic self-satisfaction. Despite being enthusiastically performed, especially when under the influence of the setting’s paranormal activity, his presence feels tacked on to the story, tied into the narrative through coincidence rather than significance. While the character’s progression towards a bizarre breakdown only heightens and becomes more entertaining, the purpose of this becomes less essential too. Mia Blake has the hardest job, playing aloof, mysterious, alluring and sensual all at a once with Sonia. Less a fully-defined character than an enigma wrapped (or unwrapped in this case) in a mystery. Her interactions with Mune carry a intentional tension that often evokes shades of Pinter, where the relationship between Carlsen hinges on being far more casual, but heightened by the audience’s knowledge that something isn’t right. Then there’s also the trickster-like presence of Min Kim as Claude the cat who, like Blake’s Sonia, is a permanent fixture of this studio space. Though more could be done to explain the mythology and context of this less than normal household pet, the interactions between him and the other characters result in some of the more theatrically playful moments of the show. That the central mystery revolves around Blake’s Sonia hardly needs a spoiler alert, treated more like a matter of fact than a surprise. The question of what she is isn’t a major concern, so much as who she is and why she is here. But when the reveal finally happens and we’re given answers, it’s unfortunately not that eye-opening. Spirit House‘s moment of truth feels like a minor event in the grand scheme of the show’s vast theatrical toolkit, failing to justify the long-winded setup. A good reveal, for most audiences, is synonymous with a good twist, subverting expectations or, at the very least, forcing us to reevaluate all that’s come before. It offers an altering of the audience’s perception a la Fight Club, The Usual Suspects and The Sixth Sense. Here, it merely forces the exposition and backstory of characters to shift to the very end, and isn’t well seeded. Spirit House‘s best surprises aren’t plot-based, but in the variety of physical and visual gags. The aesthetic qualities being its most evocative and compelling, including puppets, pratfalls and slapstick violence that pepper the stage brilliantly. The Thai influence, while not overly relevant to the story, is tastefully referenced in both the backdrop and Pongsaporn Upani’s traditional live music. The art studio setting, designed by John Verryt, is the perfect balance of naturalistic and surreal. 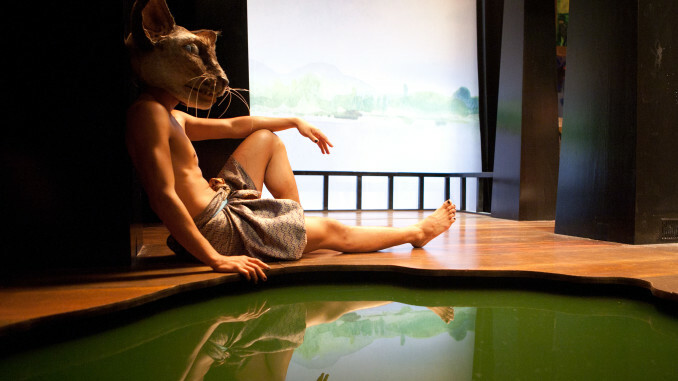 Being exactly the type of rustic space one would expect at an artist residency, but also containing strange touches like two identical ponds, adding to the sense of duality that permeates throughout the play with water, reflections and echoing. The masterfully moody lighting of Rachel Marlow is also employed as a device to signal which story we’re following, like a theatrical pull focus, creating a clear division of the time and space. One of the most mesmerising and important aspects of the show is Bland’s very own glass canvas paintings, with shades of Edvard Munch, that are used to stand in for Dixon’s. Often with fictional artists a hefty amount of suspension of disbelief is required for the audience to convince themselves that the artist is as good as they’re portrayed as. That problem doesn’t exist here. Spirit House is a masterful tone poem, evoking the feeling of displacement when you’re somewhere you don’t belong and nothing is as it seems. But as a narrative puzzle, the resulting pieces don’t fit together neatly. While there’s an immense pool of talented theatremakers involved in Spirit House, the experience ends up feeling like a magic show, where smoke and mirrors are used to distract us from a rather empty story. Spirit House is presented by Theatre Stampede and Nightsong Productions and plays at the Herald Theatre as part of the Auckland Fringe Festival until 5 March. Details see Auckland Live.